The majority of PWDs are very healthy with less than 2% of the breed being affected by serious illness. As a conscientious breeder it is my responsibility to utilize genetic health testing available to the PWD to ensure no puppies are produced with some of the common inherited diseases in our breed. If you are looking to add a PWD to your family, please take the time to research and educate yourself on the breed and health testing. There are a disturbing number of breeders out there who are breeding underage dogs or dogs with limited or no valid health testing for this breed. They have a good sales pitch and will tell you they have tested the parents…do your research…don’t be duped. Here are some FAQs and background information surrounding what you might hear or question about a potential breeder. The PWD has direct genetic testing available for JDCM (Juvenile Dilated Cardiomyopathy), GM-1 (GM-1 gangliosidosis), and two forms of PRA (Progressive Retinal Atrophy) which are prcd-PRA and EOPRA. These are all autosomal recessive genetic traits. Depending on which of these conditions we are talking about, your puppy could go blind as an adult or drop dead at 6 months of age. Your breeder should know the carrier status of your puppy’s parents in order to assure you your puppy will not be affected by these diseases. In addition to these direct gene tests, each parent should have an eye exam performed YEARLY by a board certified veterinary ophthalmologists. This exam CANNOT be performed by a general practice veterinarian. In addition to the direct gene tests and yearly eye exams mentioned above, the parents should have a certification from Orthopedic Foundation for Animals (OFA) that the parents are free from hip dysplasia. This certification CANNOT be obtained until a dog has reached 24 months of age. If you see a litter with a parent younger than 2 years old, they cannot have certification they are free of hip dysplasia. These tests should be done on parents of your puppy PRIOR to breeding to assure no puppies are produced affected with these conditions. The results of these tests are available through a public database at www.ofa.org As a part of your research, I recommend you look up the parents of the puppy you are considering in this database to see their results. Results for ALL of these tests (with the exception of JDCM) are public on OFA…period! If they’ve been performed…they are in the database. Who is the OFA? The OFA was founded in 1966 to evaluate canine hip disease, provide data management, and genetic counseling to limit the effect of hip dysplasia in hunting and working dogs. Since that time the organization has evolved into a database that serves all breeds of dogs and cats. The OFA databases are core to the organization’s objective of establishing control programs to lower the incidence of inherited disease. OFA and Eye Exam results are in the form of a colorful certificate from OFA. OFA has information regarding the validity of certificates. Currently no samples of eye certificates are on their site, however the color of eye exam certificates is a rose color. JDCM results are in the form of a letter to the dog owner on PennGen letterhead. PRA and GM-1 results are in the form of a report that includes a OptiGen Test Certificate in the center of the report. Anytime you deal with a living being the potential exists for health problems. Your breeder should be able to discuss with you the most common inherited diseases in the breed and their line. If they say there are none and no testing is needed…RUN…in the opposite direction. You should expect your breeder to use all resources available to breed a healthy litter and be able to share with you their goals for their breeding program and the steps they’ve taken toward preventing serious illness in their puppies. 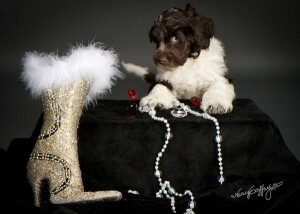 Portuguese Water Dog Breeders are often noted for their vigilance when addressing health problems. The PWD has a number of health concerns including: Progressive Retinal Atrophy (PRA), Hip Dysplasia (HD), Juvenile Dilated Cardiomyopathy (JDCM), Storage Disease (GM-1 Gangliosidosis), Addison’s Disease, Cancer, and Irritable Bowel Disease (IBD). As well as the cosmetic issue known as Improper Coat. Below is a description of each condition as well as a health test listed where available. Read the article at fellow breeder and Veterinarian Cindy O’Connor, DVM, DACT website that explains in a bit more detail, the importance of the intelligent use of genetic testing. Progressive Retinal Atrophy (PRA): Portuguese Water Dogs have two versions of PRA. The prcd- version is a genetic disease that causes late onset, slowly progressive loss of sight. The EOPRA version is also a genetic disease that causes loss of sight as early as 2 years of age. The Optigen tests are direct gene tests, thus they reveal the status of the dog as Normal (or Clear), Carrier, and Affected. Knowing the carrier status of a dog allows us to never again produce a puppy that will be affected with PRA. As prcd-PRA and EOPRA are simple recessive trait, we can breed a dog that is tested clear of either form of PRA to a dog that is clear, carrier, affected, or untested without producing an affected puppy. Carriers can be bred to clears. OFA ECR Number: BOTH parents should have a YEARLY eye exam performed by a Veterinary Ophthalmologist to determine physical anomalies in the eye. These issues could be cataracts, Retinal Dysplasia, Distichiasis, and many more issue both hereditary and acquired conditions. Storage Disease (GM-1 Gangliosidosis): Like PRA, Storage Disease is a simple recessive trait. A dog affected with Storage Disease will show neurological deterioration and will likely die by 6 to 8 months of age. The DNA test, previously offered through NYU, is now available through Optigen. Juvenile Dilated Cardiomyopathy (JDCM): JDCM is seen in puppies from approximately 2 weeks to 25 weeks. Upon autopsy a common thread of pneumonia, congestion of lungs and liver, and thickening of the walls of the heart is found. JDCM is a simple recessive trait (just like PRA and GM-1) thus a direct gene test was developed at the University of Pennsylvania. The test reveals the status of the dog as Normal (or Clear), or Carrier. As JDCM is a simple recessive trait, we can breed a dog that is tested clear of JDCM to a dog that is clear, carrier, or untested without producing an affected puppy. Carriers can be bred to clears. Hip Dysplasia (HD): is a disorder of the hip joints that affects many dog breeds of varying sizes. The inheritance of HD is quite complex. Unlike PRA, Storage Disease, and JDCM, which are simple recessive traits, HD is a polygenetic trait. A polygenetic trait involves many genes and environmental factors that add up to a dog being affected by HD. A conscientious breeder uses both hip x-ray and pedigree study to determine a dog’s suitability for inclusion in a breeding program. Two methods are currently in use in the United States for determining hip status. The first and most widely used is called OFA. After a dog has turned two years of age, a Veterinarian does a specific X-Ray that is then submitted to the Orthopedic Foundation for Animals (OFA) for evaluation by their panel of Veterinarians. This evaluation is subjective. The results can vary according to the quality of the X-Ray submitted. The dog’s hip status is rated using Excellent, Good, and Fair for dogs that do not exhibit HD, and Mild, Moderate, and Severe for dogs that are dysplastic. Another method of Hip Dysplasia detection is utilized by PENNHip. The PENNHip evaluation is done by a Veterinarian specifically trained in the PENNHip protocol. The PENNHip mission is to develop and apply evidence-based technology to direct appropriate breeding strategies aimed at reducing in frequency and severity the osteoarthritis of HD. A PENNHip evaluation can be done on dogs 16 weeks of age and older. Even with the most selective breeding, pedigree research, attention to nutrition, HD can be produced. Addison’s Disease (Hypoadrenocorticism): Addison’s disease results from the autoimmune destruction of the adrenal gland. Its vague symptoms of lethargy, depression, weakness, and vomiting usually appear at around four years old. Though cases in younger dogs and older dogs have been reported. Addison’s Disease is often called “The Great Mimicker” as the symptoms are often vague and can be representative of so many other illnesses and diseases. Unfortunately it does not appear that Addison’s is the result of a simple recessive gene. Additional genetic factors may be involved. At this time it is believed to be familial (running in families). Once diagnosed (usually after an Addisonian Crisis) the disease is very treatable and once managed the dogs live long healthy lives with monthly injection of Percorten-V, as well as a regimen of prednisone (especially around times of stress). Cancer: Studies have not truly identified the PWD as having a higher incidence of cancer than the normal dog population, though there are some indication they may be. The PWDCA and PWD Foundation are supporting the research of Dr. Jamie Modiano at the University of Minnesota. A leader in the study of canine cancers and their prevention, detection, and treatment. Inflammatory Bowel Disease (IBD): IBD has been reported in the PWD. The disease is characterized by frequent diarrhea and other gastrointestinal symptoms. The mode of inheritance has not been determined. Improper Coat (IC): Please note that IC is NOT a health condition. There is a test available through Optigen to test a dog’s carrier status. A dog affected by IC has a naturally patterned coat where the hair on the face, front of legs and feet is naturally short. Hair around the neck and withers is longer. These dogs resemble a flat coat or curly coated retriever. They do shed, some more than others. An IC puppy can be identified by a practiced eye as early as three weeks old, though by 7 weeks it is very clear that a dog has an improper coat. IC is a simple recessive, thus a dog tested Clear will not produce a puppy with IC regardless of the other parent’s status. *Please note that Improper Coat is different from “Hairloss”. A dog with Hairloss has dry, brittle hair which ultimately falls out leaving large bald areas. The mode of inheritance is unknown, though it has been found to occur more frequently in Curly to Curly Breedings as opposed to Curly to Wavy or Wavy to Wavy breedings. Hairloss is a significant and heartbreaking condition. Often it is not truly recognized until the dog begins to exhibit balding (usually starts around the eyes and flank regions). The dogs can go through times of having an almost normal covering of hair to extensive balding. In hindsight breeders or owners recall the puppy having dry and brittle curly hair, as well as, difficulty growing and maintaining coat. Again, Hairloss is often said to be significantly linked to the practice of breeding Curly to Curly. The above issues certainly do seem like a daunting list of potential health issues. The most important thing to understand is that the large majority of PWD breeders are working hard to control and/or eliminate as many health issues as possible. Responsible breeders look at the whole dog, the breadth and depth of their pedigree, when attempting to ascertain what may be a good breeding to undertake. Any breeder who tells you their dog “is clear for everything” absolutely has not looked past the 5 or so Health Tests typically used by the PWD community. There are a multitude of factors that a breeder must weigh when deciding, first, to include a dog in their breeding program, and second, what dog would be a good breeding match. These factors include Temperament, Type, AND Health! Even the best laid plans can produce a health issue. Most long time dog breeders will tell you, “If you breed long enough you will ultimately produce it”. Though it is the serious PWD Breeder’s job to recognize the severity and effect of a health issue to ascertain if a dog should be eliminated from a breeding program if they have produced, have relatives that have produced, or are affected by a health issue. You can read more about the health concerns of the Portuguese Water Dog at the parent breed club website in the section on health.